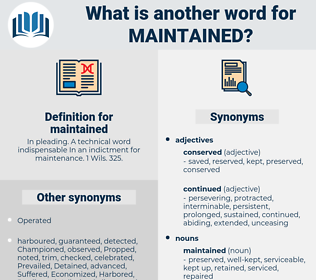 What is another word for maintained? In pleading. A technical word indispensable In an indictment for maintenance. 1 Wils. 325. Maintaining, releases, controls, retain, continued. Remained, manage, Managed, Gained, guaranteed, reaffirm, reaffirmed, Detained, Stayed, monitored, Explained, Investigated, Generated, implementation, Persisted, relatively, Complained, affirm, affirmed, estimated, interpreted, nominated, Indicated, confirmed, ensured, Existed, Reiterated, stuck, protected, Defended, manned, removed, saved, interacted, committed, joined, organized, Created, preferred, assumed, characterized, relationship, abided, Claimed, emphasised, conducted, Testified, Installed, reported, Inserted, Achieved, insured, repeated, Mended, determined, Demanded, Promoted, left, Enjoyed, emphasize, emphasized, HIT, Nurtured, satisfied, represented, suggested, Followed, Undertook, sat, data, Enunciated, treated, Incubated, informed, observed, Championed, champions, considered, facilitated, Drafted, acknowledged, accepted, identified, Contributed, accordance, renewed, Prosecuted, Wrote, pointed, verified, Inspected, Remanded, reinforced, attested, Contended, assure, assured, Benefited, Bolstered, status, violated, supported, developed, handled, Cooperated, reassured, earned, be, Was, Were, Exercised, enlisted, collaborated, defined, clarified, pretended, struck, advanced, Seconded, Resumed, alleged, Advocated, Stood, imposed, Delivered, Deemed, practiced, prepared, derived, Complied, Performed, Argued, set, empowered, highlighted, settled, respected, calculated, Stipulated, revised, exert, Commented, underscored, Responded, predicted, qualified, completed, Mentioned, Carried, always, reserved, advised, Regarded, paid, recognised, Corresponded, outlined, recommended, realized, noted, described, Prevailed, contented, Brought, account, found, Assessed, opened, put, watch, recognized, Averred, perceived, Wore, occupied, Believed, Issued, Displayed, declared, stressed, concluded, Filed, Visited, Became, added, opinions, addressed, briefed, agreed, wanted, notice, notices, postponed, bore, invited, showed, Sued, Arose, played, pledged, produced, Viewed, on-going, Ranged, thought, Invoked, honoured, credited, Deposited, sought, pressed, subsidized, Rescinded, said, Discussed, formed, up-to-date, Took, required, laid, contested, possessed, Lasted, underlined, raised, shared, reasoned, chased, conferred, subsidised, countered, listed, revealed, opinion, endorsed, Concurred, Lived, applied, fuelled, spent, Cared, posted, included, spoke, Met, felt, Worked, Convened, professed, Told, advice, showcase, Hoc, favour, Favoured, Served, stoked, purported, expressed, Talked, effected, rule, ruled, lay, made, Dealt, Lobbied, covered, Pleaded, Resulted, led, tried, elaborated, stated, Helped, Acted, welcomed, Urged, sponsored, Replied, backed, Scored, Chaired, favored, Meant, Went, D, Wished, Asked, concerned, Gave, Had, funded, placed, Looked, saw, loved, called, requested, heard, based, Got, Ran, Did, 'd, continued. Remained, attained, Obtained, restrained, Managed, contained, trained, Gained, guarantee, guaranteed, reaffirmed, consolidated, Detained, Stayed, monitored, implanted, Explained, well-managed, Denominated, Investigated, safeguarded, stabilized, initiated, Generated, administrated, incorporated, Perpetuated, Examined, constrained, affirmed, conserved, estimated, Incarcerated, interpreted, Indicated, demonstrated, stimulated, substantiated, Caught, confirmed, appointed, compliance, ensured, augmented, Existed, designated, stuck, accumulated, relations, protected, coordinated, Defended, Accommodated, manned, removed, mediated, cultivated, Waited, organised, saved, mandated, reappointed, criminalized, committed, Ceased, joined, organized, constituted, reservation, motivated, stable, Participated, matched, Furthered, Submitted, articulated, complemented, Stationed, Created, categorized, amended, preferred, Standards, withdrawn, assumed, characterized, relationship, impaired, abided, Instituted, enhanced, evaluated, Claimed, circulated, secured, emphasised, conducted, Installed, reported, Inserted, Achieved, insured, assigned, adjusted, repeated, accomplished, Enacted, increased, dismissed, Mapped, Emitted, Replicated, determined, Transferred, Constructed, stopped, impeded, conditioned, system, collected, adopted, Demanded, Promoted, left, encouraged, acquired, Undertaken, Enjoyed, emphasized, repaired, Nurtured, Energized, satisfied, cherished, document, documented, represented, arranged, suggested, action, Followed, Compiled, sat, instructed, emergency, nourished, treated, Incubated, principle, informed, observed, Elucidated, invested, Operated, Championed, considered, financed, facilitated, formalized, written, measured, Drafted, acknowledged, accepted, identified, Contributed, Introduced, presented, formulated, engaged, altered, renewed, Prosecuted, pointed, verified, adapted, appropriated, gathered, associated, withheld, separated, Enshrined, reinforced, regulated, Contended, attended, assured, Comprised, Enabled, finalised, Bolstered, status, violated, Been, supported, accompanied, developed, handled, Fought, stockpiled, built, apprehended, Underpinned, supervised, Remitted, tracked, Enjoined, reassured, fastened, classified, Exercised, heated, practised, defined, positioned, discontinued, clarified, headquartered, pretended, located, permitted, Replenished, struck, advanced, Prompted, intended, entrenched, Resumed, alleged, received, Advocated, Notified, Incurred, Stood, imposed, Delivered, Enriched, forged, Deemed, authorized, reviewed, prepared, derived, governed, understood, Overseen, fixed, Complied, ended, website, Consulted, Computed, Exerted, restricted, Performed, register, registered, Argued, filled, set, Cited, Translated, highlighted, settled, respected, calculated, Capitalized, revised, bound, underscored, composed, designed, Contravened, predicted, witnessed, fixated, granted, qualified, Endured, finalized, situated, site, completed, Mentioned, Carried, always, reserved, advised, treasured, Emerged, selected, Progressed, Regarded, paid, recognised, Devised, Tended, checked, outlined, mounted, executed, deprived, Arrived, utilized, realized, proved, proven, inscribed, noted, discovered, described, Accounted, Tasked, attached, valued, owned, Prevailed, charged, changed, deducted, equal, canned, embodied, Watched, detected, directed, Brought, furnished, archived, employed, Tackled, staffed, affected, obligated, found, uncovered, Assessed, Excluded, accessible, opened, Construed, exploited, put, connected, Rendered, recognized, Captured, confined, reflected, perceived, untouched, lost, exposed, printed, tailored, protracted, needed, Warned, proceed, Entered, occupied, populated, authorised, Compared, Believed, Fitted, ranked, Deployed, planned, suspended, available, arrested, rooted, Issued, Displayed, suited, onboard, prohibited, declared, stressed, concluded, convicted, decided, damaged, expected, Filed, added, addressed, experienced, started, allocated, replaced, noticed, agreed, Borne, recorded, Obeyed, Targeted, fed, Shown, wanted, Averaged, linked, treaty, invited, specified, Discounted, learned, upgraded, disclosed, obliged, Sued, deferred, used, played, cloaked, pledged, Propelled, produced, prescribed, equipped, breached, Viewed, grown, thought, destroyed, Invoked, subscribed, promised, hired, Returned, refreshed, Propped, honoured, credited, Deposited, sought, pressed, sworn, drawn, persecuted, compelled, subsidized, taken, delayed, warden, said, proposed, Stowed, Overhauled, Afforded, Supplied, framed, drilled, related, Discussed, Escorted, formed, approved, guided, up-to-date, Pushed, required, Challenged, laid, Disbursed, Compromised, risen, locked, frozen, Lasted, underlined, cultured, quit, Appraised, raised, Bred, roster, shared, Tabulated, accused, chased, subsidised, vested, graded, listed, processed, fueled, revealed, involved, discharged, accessed, spoken, endorsed, Harvested, Evolved, Lived, accrued, applied, fuelled, spent, Cared, posted, included, projected, Earmarked, mined, Launched, Depended, up-dated, Caused, Met, felt, chosen, Worked, Convened, Told, stocked, sprayed, Awarded, Sentenced, Reared, forbidden, Quoted, Logged, Favoured, Served, stoked, expressed, Classed, Talked, effected, booked, Exceeded, Referred, rule, ruled, desired, made, dressed, headed, shaped, tabled, enrolled, scheduled, Dealt, Voted, covered, Resulted, led, Occurred, aided, Abetted, tried, Greeted, elaborated, stated, Helped, Lodged, Acted, underlain, Reached, welcomed, closed, Urged, Allowed, sponsored, Passed, Pooled, backed, released, Scored, driven, Chaired, forced, favored, controlled, gone, web, Counted, Buoyed, supposed, given, have, Has, known, D, Wished, pronounced, Asked, concerned, Worded, Offered, Had, funded, spread, Accorded, Housed, VOL, seen, sorted, placed, Looked, sold, powered, Subjected, founded, called, focussed, requested, heard, Gotten, based, Got, vi, run, done, continued. ascertained, preserved, Administered, Insisted, safeguards, conserved, asserted, Adhered, Submitted, submits, secured, guard, repaired, pursued, Operated, engaged, relation, built, fulfilled, owned, extended, Proceeded, sustained. ascertained, preserved, Administered, Insisted, asserted, Adhered, guarded, enforced, unchanged, pursued, moved, interviewed, fulfilled, fostered, extended, stored, ordered, sustained. The central office at Washington is still maintained.
" It was not intended that you should," maintained Elfreda. maidenhood, motmot, Mundanity, minute hand, monodontidae, mountain tea, maddened, maiden aunt, mountain heath, mediant, mountain mint, mutant, midinette, muttonhead, maidenhead.